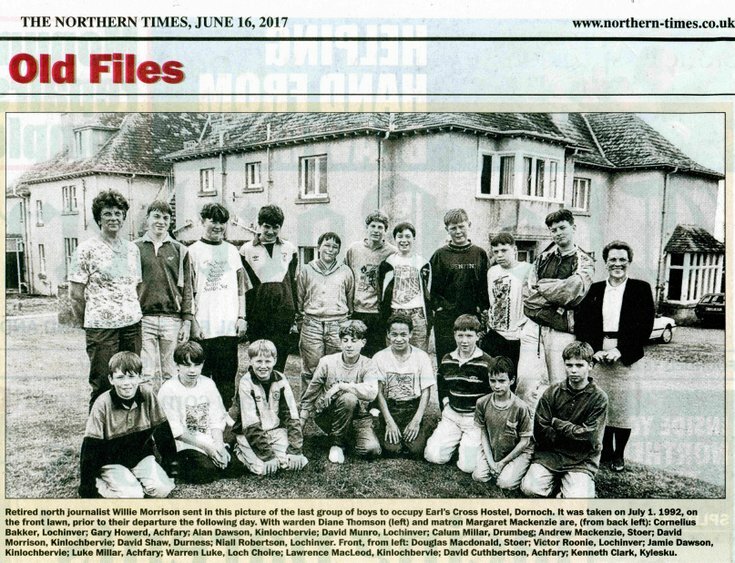 An extract from 'Old Files' published in the Northern Times of June 16, 2017 with a monochrome group photograph of the last group of boys to occupy Earl's Cross Hotel Dornoch. The photograph was taken on July 1, 1992 on the front lawn of the Earl's Crtoss Hostel the day before their departure. Back row left to right: Diane Thomson (Warden) Cornelius Bakker, Lochinver; Gary Howard, Achfary; Alan Dawson, Kinlochbervie; David Munro, Lochinver; Calum Millar, Drumbeg; Andrew Mackenzie, Stoer; David Morrison, Kinlochbervie; David Shaw, Durness; Niall Roberson, Lochinver and Margaret Mackenzie (Matron). Front Row left to right: Douglas Macdonald, Stoer; Victor Roonie, Lochinver; Jamie Dawson, Kinlochbervie; Luke Millar, Achfary; Warren Luke, Loch Choire; Lawrence MacLeod, Kinlochbervie; David Cuthbertson, Achfary; Kenneth Clark, Kylesku.